To what ongoing news story does this cartoon refer? People have opposing views about the probability that man’s use of fossil fuels (gas, oil, coal) will cause catastrophic climate change. Many issues can be controversial. While you might not feel strongly about a certain topic, others around you might take a strong position on one side or the other. Learn to logically defend your position, and politely respect your neighbor’s point of view. And if your neighbor gets argumentative with you, remind each other that both sides need to be tolerant of the other’s point of view. The issue of man-made global warming is extremely controversial. Many people will absolutely refuse to hear the opposing view on this issue. The better approach is to learn the facts/statistics supporting your side of the issue and to be able to express them clearly and concisely. 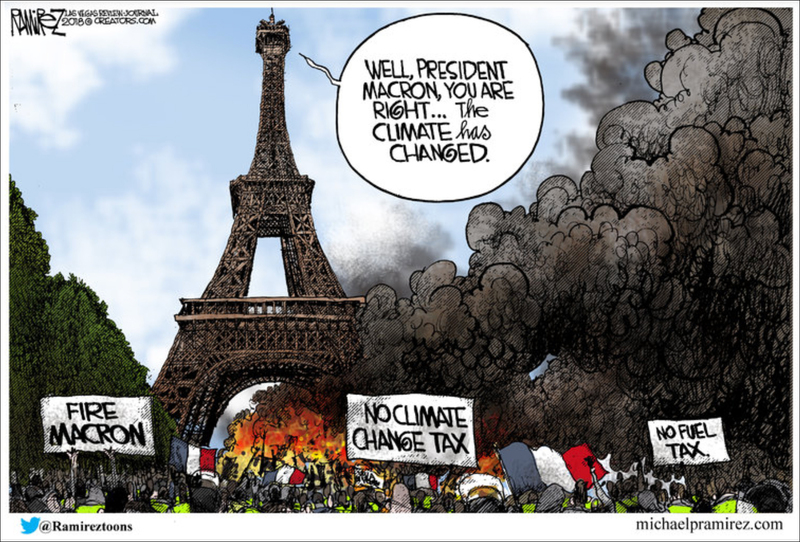 For weeks, the French people have been protesting President Emmanuel Macron’s climate change fuel tax that he has implemented to get people to stop using fossil fuels (gas, oil, coal). The fuel taxes were meant to go into effect in January as part of France’s plan to fight global warming. Global warming is an important issue to understand. The theory that man’s use of fossil fuels (burning coal, oil and gas for energy, which produces carbon dioxide, or CO2) is causing an imminent catastrophic change in the climate – global warming – is believed to be true by many scientists, climatologists, citizens, the mainstream media and Hollywood celebrities, and was made popular by former Vice President Al Gore’s movie “An Inconvenient Truth.” People who believe in this theory say we must reduce the amount of carbon dioxide produced by limiting/reducing the amount of fossil fuels we use, or by purchasing offsets. Read a commentary on Global Warming at studentnewsdaily.com/commentary/global-warming-update.